Libya, a mostly desert and oil-rich country with an ancient history, has more recently been known for the 42-year rule of the mercurial Colonel Muammar Gaddafi - and the chaos that has followed his departure. Libya was under foreign rule for centuries until it gained independence in 1951. Soon after oil was discovered and earned the country immense wealth. Colonel Gaddafi seized power in 1969 and ruled for four decades until he was toppled in 2011 following an armed rebellion assisted by Western military intervention. In recent years the country has been a key springboard for migrants heading for Europe, and a source of international concern over the rise of jihadist groups. The toppling of long-term leader Muammar Gaddafi in 2011 led to a power vacuum and instability, with no authority in full control. The country has splintered, and since 2014 has been divided into competing political and military factions based in Tripoli and the east. Among the key leaders are Prime Minister Fayez Sarraj, head of the internationally-recognised government in Tripoli, Khalifa Haftar; leader of the Libyan National Army, which controls much of eastern Libya; Aghela Saleh, speaker of the House of Representatives based in the eastern city of Tobruk; and Khaled Mishri, the elected head of the High State Council in Tripoli. Islamic State group briefly took advantage of the conflict to seize control of several coastal cities including Sirte, which it held until mid-2017. It retains a presence in the desert interior. Libya's media environment is highly-polarised and virtually unregulated, reflecting the country's political instability. 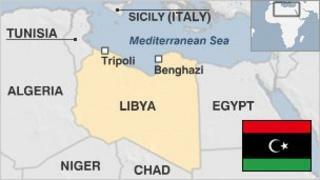 Satellite TV is a key news source and many outlets are based outside Libya. Journalism is fraught with danger; reporters face threats and attacks. 7th century BC - Phoenicians settle in Tripolitania in western Libya, which was hitherto populated by Berbers. AD 643 - Arabs conquer Libya and spread Islam. 1911-12 - Italy seizes Libya from the Ottomans. Omar al-Mukhtar begins 20-year insurgency against Italian rule. 1942 - Allies oust Italians from Libya, which is then divided between the French and the British. 1969 - Muammar Gaddafi, aged 27, deposes the king in a bloodless military coup. 1992 - UN imposes sanctions on Libya over the bombing of a PanAm airliner over the Scottish town of Lockerbie in December 1988. 2011 - Violent protests break out in Benghazi and spread to other cities. This leads to civil war, foreign intervention and eventually the ouster and killing of Gaddafi.